Nigel is a 25 year old smith who first stepped up to the anvil when he was thirteen years old. Throughout his childhood Nigel was always enthralled whenever he entered a blacksmith shop and never hesitated to ask a long list of questions. He finally fell in love with metalworking while participating in a Junior Volunteer Program at nearby Meadowcroft Museum of Rural Life. Having whetted his appetite for the art of blacksmithing, Nigel sought to set up his own forge on his family's farm. After going to numerous auctions and flea markets, Nigel finally acquired enough tools to get rolling. 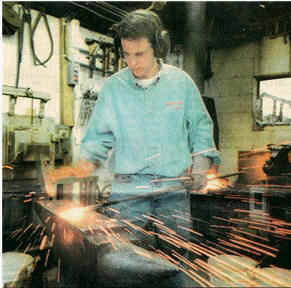 By the time he was fifteen, he was ready to bolster his basic skills, and has since taken twenty five courses at Touchstone Center for Crafts, Uniontown, PA, Center for Metal Arts, Florida, NY and B2 Power Hammer School, North Carolina. Nigel has also attended numerous blacksmith gatherings and conferences to expand his horizon and expertise. Nigel has since come full circle and taught blacksmithing courses at Touchstone Center for Crafts in the fall of 2004 and 2005. In May of 1999 he graduated third in his class from Madonna High School, Weirton WV; with a 3.978 GPA. The following January, Nigel took a twelve week long precision tool and die course at Penn United, Saxonburg, PA.
Nigel was selected by ABANA (the Artist Blacksmith Association of North America) to study at the renowned International Teaching Center for Metal Design in Aachen, Germany with Timm Bredohl and Andreas Gueldenberg. Some of Nigel’s work that he made during his studies in Germany was featured in Hephaistos, the Central European blacksmithing magazine. Nigel was a demonstrator at the 2004 biannual ABANA national conference. He demonstrated hand chasing the feet on a chest that sold for $12,500 at auction to benefit the association. In 2005 Nigel demonstrated at the American Society of Metals Heat Treating Conference and the International Preservation Trades Workshop. Nigel’s work has been exhibited at “Contemporary Blacksmithing,” Ice House Gallery Berkeley Springs, WV; “Contemporary Metalsmithing,” Hart Moore Gallery, Farmington, PA; and “Artisans in Metal: Metal through Time,” Kent State University Gallery, East Liverpool, OH. In September 2005, his equatorial sundial won first place at the Southern Ohio Forge Association Conference in September. (Next to the biennial National Blacksmith Conference, SOFA is the largest blacksmithing conference in the US -- and so, quite an honor.) Nigel also won 2nd prize in the 2005 SOFA forging contest. Nigel is currently focusing on architectural ironwork and his work can be found in Germany, Belgium and several states including Colorado, Connecticut, Hawaii, Illinois, Kentucky, Maryland, Mississippi, New York, North Carolina, Ohio, Pennsylvania, Vermont, and Virginia. To see much of what he has done, check out Nigel's Portfolio and Resume.